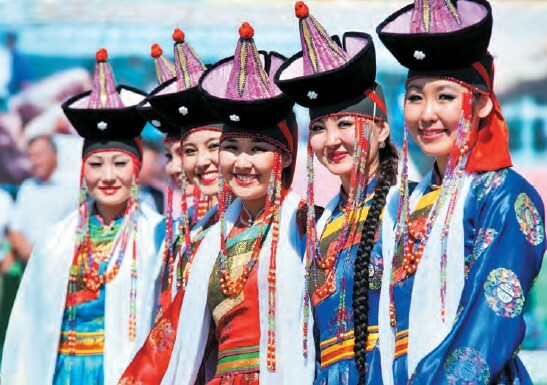 Vastly remembered as the land of the Mongol plunderers and Genghis Khan in history, Mongolia that had been under the influence of the neighbouring countries China and Russia until 1990s, is opening to the rest of the world. A flight route from Frankfurt to Beijing goes exactly over Ulaanbaatar, capital of Mongolia, where pilot would take a light southwardly turn towards the inner Mongolia to proceed later to Beijing. Early morning when I would get up, during my more than two-dozen visits to China, on the left side, 10 kms below, I would gaze through window to see tiny spots of Ulaanbaatar. I could clearly see the west-east route of transSiberian railway and Tuul, the river around which the city is established. Sipping Indian tea offered early in the morning by the air hostess, my memories of visits to Mongolia would descend on Tuul river banks, Gandan monastery on east of the city, Zaisan hills from where one gets full panorama of the city, horse-milk markets and the nearby Bogd Khan Mountain, a UNESCO World Heritage Site. But what entangles in string of my memories are the stories of nomads of Mongolia, their culture and their struggle with ‘immobile modernism’ and their painful migration to the cities. Many are also puzzled about Mongolia’s history of cruel war enraged by Genghis Khan, a hero for Mongolians, and at the same time existence of teachings of pacifist Buddhism that Mongolians embraced through scores of monasteries across Mongolia.The biographies of Genghis Khan are, however, replete with stories that depict the other side of this warrior. First of all, Genghis Khan has nothing to do with ‘Khans’ as we know in Indian subcontinent. Second, Genghis Khan’s strategic focus was on unification of nomads and tribes under one empire so that it becomes fortified shield against attacking enemies in the 13th and 14th centuries. Genghis Khan was religiously tolerant and interested in learning philosophical and moral lessons from other religions. He took advice from Buddhist monks, as well as from Muslim and Christian missionaries. It is this history and legacy of secularism, fights for solidarity and respect for nature that makes tourism in Mongolia most satisfactory. Genghis Khan himself followed a religion called Tengrism that sees life as living in harmony with the surrounding world. Tengrists consider that their existence is sustained by the eternal blue sky (‘Tengri’ means sky) and the mother-Earth. Even modern Mongolians today pray to Blue Sky. 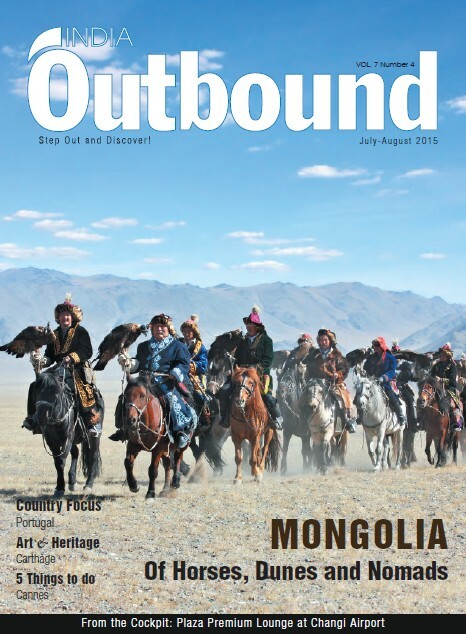 Mongolia is also branded, albeit poetically, and referred as the “Land of Eternal Blue Sky”. In 2013, Mongolia was the country of choice by United Nations Environment Programme ( UNEP) for celebration of World Environment Day. A new Partnership for Action on the Green Economy (PAGE)-a major new initiative to assist the global transition to a green economy was announced by UNEP with Mongolia. “ For the last seven or eight years we have had great growth, from 8-15 per cent, and it is important that we build in good basics of green growth and green economy” said Mongolia’s environment and green development minister Sanjaasuren Oyun. Mongolia is developing policies on sustainable mining, renewable energy and ecotourism that will place it on a green development path. 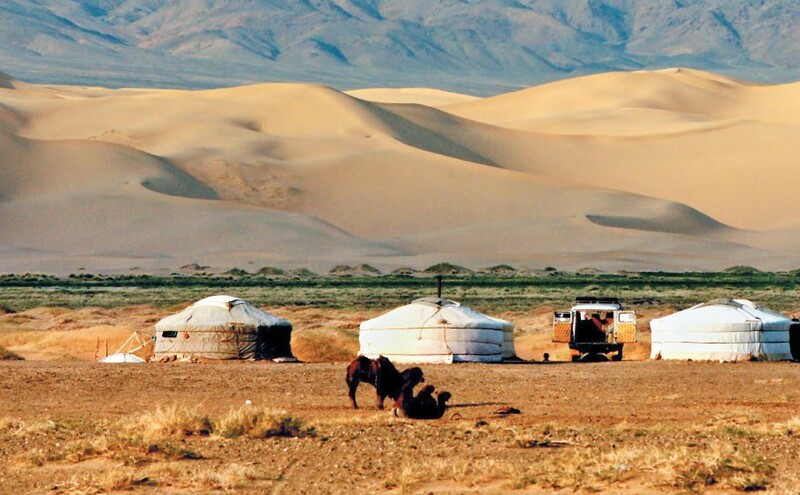 UNEP plans to engage Mongolia on a host of other issues, including climate change. Mongolia’s 2.1 degree centigrade rise in temperature over the last 70 years has led to drier conditions and degradation of pasture-land, placing pressure on traditional nomads. When I visited Mongolia for the first time in mid 1990s, the country was going through massive transition from the central economy of USSR. It was a painful time because for the first time it was opening to outside world and other countries. Outside two giants i.e. Russia and China as neighboring countries, Mongolia did not deal with other countries for long. I always imagined that with its serene and virgin landscapes, steppe, biodiversity and loving adventurous people, this country would one day progress at massive speed. Unfortunately the country lacked adequate infrastructure at that time. With hardly any electricity, hotels and transportation, the tourism was at its infancy. Railway connection with Beijing was used by the Mongolians to go there and comeback with loads of Chinese goods to sell in the country. But that changed over two decades. With policy of market economy, China, Japan and Korea initiated massive infrastructural projects that have made Mongolia one of the most desired attractions for business-tourists. Lately when I visited Mongolia, I saw the transformation in rather different way. Like Genghis Khan’s war-sorties to unify nomads and tribes, now market seems to be uniting them, in good way as well as bad. Ulaanbaatar, where 40 per cent of the country’s population lives, is known as world’s coldest capital with temperature reaching up to minus 50 degree centigrade for several days. My visits luckily were during May to September. As a vegetarian, I was awkwardly trapped in Mongolia. Meat is the staple food and horse’s meat is available almost in all shops. Marmot’s meat is considered as delicacy. In this world of ‘livestockfood-markets’ I had to curtail my intake only to milk products, raw vegetables, dried curd-balls (aarul) and cheese along with porridge made in milk. Morning-tea is what one gets in monasteries which is salted. The national drink called airag is fermented horse’s milk. My friend arranged to take me to the market outside Ulaanbaatar early one morning to get healthy and well-fermented horse’s milk. Tourism is nearly dead during winter. It is said that during winters there are only two jobs in Mongolia, driving a taxi for rich locals and foreign businessmen and working in the mines. However, there is full potential for winter sports and winter tourism provided government initiates adequate facilities and trains the youth. 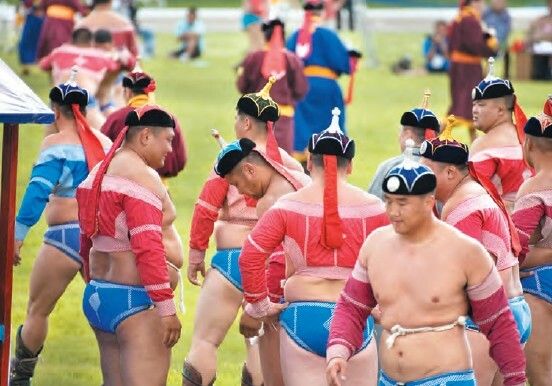 During summer a ‘three-gamefestival’ called Naadam has now become tourist attraction. Recently the Indian Prime Minister Narendra Modi participated in mini-Naadam to perform two of the three items – horse riding, archery and wrestling. He did not do wrestling, as humor goes, because he does it every day in India with opposition parties. Interestingly number of agencies including United Nations started in early 1990s ‘exceptional’ programme to build schools for nomad children at some central places. Idea was to ensure education among nomads. However, these ‘western style’ modern methods met with mixed success. They were soon criticised as means to destroy the nomadic culture and learning from nature. 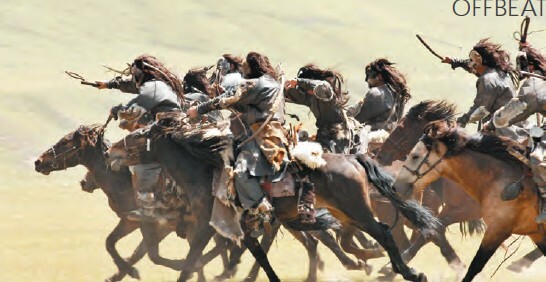 It is till date a big debate in Mongolia if the nomads are to be settled at all! In my later visit to Ulaanbaatar in winter, the blue sky had turned into grey due to usage of coal for heating purposes. The mining business mainly for copper and in small way for gold was on rise. The Chinese and rest of the world looks at Mongolia more for business-rides for mining the copper and gold than for horse- rides. The business tycoons seem to enjoy vodka more than airag! And they enjoy the Genghis Khan bars more than his biography. During one of my visits, I was taking my early morning brisk walk through exploring the surroundings of the ErktetSuldGher Camp, about 25 km outside of Ulaanbaator. It was the venue for a UNEP conference organised by my office. It was a very innovative venue for UN conference, as we stayed in Mongolian ghers (round shaped rooms assembled and dissembled by nomads). Even conference was in a huge gher, a point of departure from the usual hotel conference rooms! End of June, traversing the steppe, amidst the bare hills was a unique experience. A vast green pasture, blue sky, a slow wind blowing across the hills made it a true dream walk. Walking along a small track, I noticed something which I had never seen before. It was a marmot (boodog in Mongolian) hurrying back to its underground hole, carrying a white piece of plastic foam in its mouth. By the time I reached the hole, the marmot was already deep inside, but the white foam was a few inches down from the opening of the hole. I spotted some more white pieces brought by the marmot, arranged like a barricade at the entrance with a small opening on the side only for marmots to go inside. I could clearly see that these were pieces of insulating packaging Styrofoam picked up by marmot from a nearby construction site. The marmot was obviously preparing for winter, almost three months away! Marmots are the most common rodents in Mongolia. The number of underground mammals such as rabbits and marmots is higher than the aboveground animal population like camels and horses. This particular marmot must be an intelligent one and ‘responsive’ to change as per Darwin’s theory of “survival of the fittest”. The insulating foam protects the marmot against harsh winter winds blowing across Mongolian pastures. Obviously, the Mongolian marmot has entered the 21st century with the full knowledge of modern markets and technological products! As I strolled in the crispy cold morning, I wondered how the pristine ecosystem in Mongolia is changing. Maybe the Mongolian marmot has masterminded climate adaptation by finding an unusual solution to make the Mongolian winters warmer. I stopped this silly thought and took a picture of that insulated home of the marmot instead. A clear message to me from ecosystem of Mongolia that Tengrism is disappearing, blue sky is becoming grey and that nature is adopting to modern markets and technologies. Clothing from camel’s wool, one of the most valuable products from Mongolia against its harsh winter are getting replaced by the synthetic plastics imported from China. Fermented horse milks are getting replaced by Vodka. By air: The national airline of MIAT (Mongolian International Air Transport) connects the interior of the nation well. You could also access most major airports in Mongolia if you travel to the country. MIAT, itself operates flights to Berlin, Beijing, Seoul, Moscow and other Russian airports from Mongolia’s capital city Ulaanbaatar’s airport, BuyantUkhaa. In the summer, Mogolian airports also remain connected to Hong Kong, Osaka and Singapore. By rail: Surface transport is quite well established in Mongolia. Frequency is quite good. In fact, there are regular trains of Trans-Mongolian Railway that connect Ulaanbaatar to Beijing and Moscow. Other Russian and Chinese trains also operate across the frontier. With its wild and untamed delights, Mongolia is not necessarily the place to go for high-end resorts or palace hotels. However, there are plenty of cosy options around the country, especially in the capital city, Ulaanbaatar. Camping and stays in ger tents are also popular options, with some beautifully appointed stays in remote locations available for the adventurous.